There's a scene at the end of the film Labyrinth (spoilers ahead!) - and yes, this is going somewhere - where Sarah faces down the Goblin King, Jareth. Jareth, played by a blazingly hot David Bowie in some very, very, tight trousers, promises Sarah the world and his kingdom - if she'll just let him be her ruler. Sarah, keen to retrieve her baby brother, Toby, refuses him and starts an incantation from her children's book to defeat him. - and with that epiphany, the spell is broken. That's what Sadiq Khan has done. He has turned to Trump (who is far from the tempting dish Bowie presents, after all,) and dismissed his tantrums. *Well, technically, he refused to 'rise to beastly comments' - but same diff. 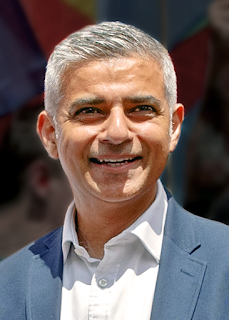 Khan, London's first BAME (Black And Minority Ethnic,) mayor, a British Muslim of Pakistani parentage, is the face of everything Trump can't stand. Khan symbolises tolerance. He symbolises the diversity of the modern West. And he symbolises the success of Muslim and BAME (or PoC) people within that. Sadiq Khan symbolises a world where you don't have to be a white allocishet able-bodied male to succeed. And that terrifies Trump. It terrifies Trump for the same reason that Angela Merkel and Barack Obama terrify Trump: they are a glimpse into a future where people like him aren't automatically on top. A future where, to succeed, Trump would actually have to be competent, and probably a decent person, too. And Trump is neither of those things. Sadiq Khan does not fear Trump, and neither does he court his favour. In Trump's self-centred world-view, that's damn near impossible. Add to that Sadiq Khan's ethnicity, religion, heritage, and popularity, and you begin to see why Trump singles him out so much. Just as Jareth fears Sarah's words, and pleads for her to stop, Trump fears Khan's calm replies. Donald Trump is afraid of Sadiq Khan. Because he has no power over him. And yes, it's certainly easier for the Mayor of London to speak against Trump than it is for a lot of people who actually live in the US and don't have the protection of that level of office. But that's kind of why it's so important for people like Sadiq Khan to speak out. He has the authority, the platform, and the protection. The only way to defeat the powerful is to show them how powerless they really are. I loved Khan’s actions towards Trump! I don’t know much about him but he seems like a great, firm mayor but also with a sense of humour! I'm not a Londoner (obviously!) but Mayor of London is a prominent job here, and I think he's done v. well so far! His way of dealing with Trump's random and personal attacks on him is spot on! I have not been following the news and really shouldn't comment on anything political as I am clueless. Tbh I don't even follow everything going on anymore because ugh. But I love everything you said in this post! And I loved what I saw of the UK's anti-Trump reaction to his visit. Thank you! And yeah, we're not big fans of him here! A few people support him (because, ugh, people,) but most of us (and most of the rest of the world) couldn't believe it when he was elected.